Welcome to Dog Math. Specifically, we are referring to the art (and science) of calculating the number of calories, which plays into how much to feed a dog each meal. If you feel a bout of canine cuisine confusion coming on, you’re not alone. The majority of pet parents rarely count how many calories their dogs eat each day. But knowing exactly what your dog is eating and how much can go a long way in keeping your canine chum at an ideal weight. “Feeding excessive calories leads to undesired weight gain that shortens the life span of a dog,” notes Sean Delaney, DVM, a veterinary nutritionist and founder of the BalanceIt.com website. Before knowing how much to feed a dog, let’s look at the definition of a calorie. Photography ©TerryJ | Getty Images. 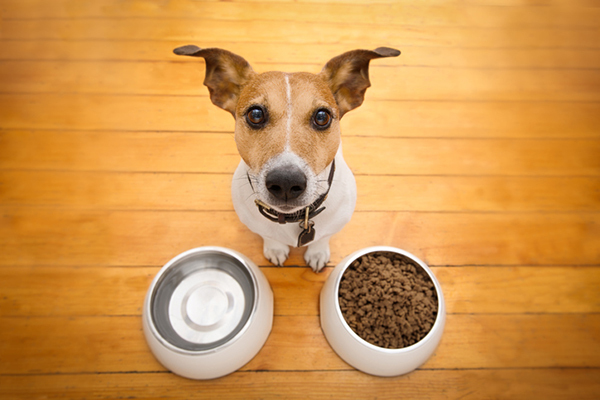 When it comes to how much to feed a dog, let’s start with the definition of a calorie. Scientifically termed kilocalorie or kcal, a calorie is a unit of energy in a serving of food. If you want even more detail, a calorie is defined as the amount of heat needed to raise the temperature of a kilogram of water by 1 degree Celsius. Clear as mud, right? So, how do calories play in to how much to feed a dog? How do you calculate how many calories your dog needs? Photography ©Chalabala | Thinkstock. Here’s the scoop: In general, most dogs need to eat between 25 and 30 calories per pound of body weight to keep from gaining or losing weight. So, for Kona, my terrier mix, I need to make sure she eats between 625 and 750 calories per day. I also need to take into consideration her age (3 years old), activity level (medium) and the fact that she is spayed. 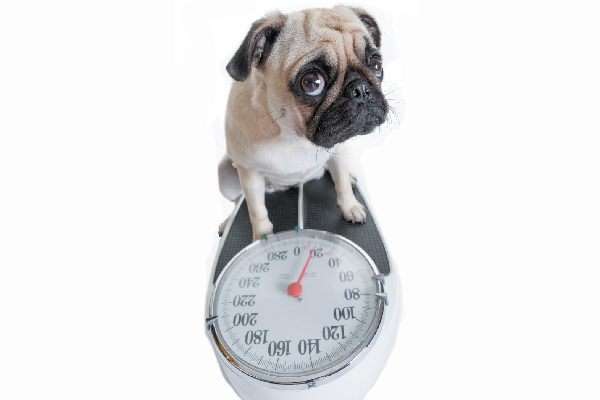 For you math buffs eager to calculate your dog’s daily caloric needs, you need to divide his body weight in pounds by 2.2 to convert to kilograms. Next, you have to calculate your dog’s resting energy requirement (RER) by using this equation: 70 (body weight in kg)^0.75. And then you need to identify commonly used multipliers that factor in your dog’s age, weight, activity level and if your dog is spayed/neutered or intact in calculating the calories. Uh, OK. Hang in there. Fortunately, there are calorie-counting calculators on websites and apps you can download to assist you in tallying your dog’s daily caloric consumption (see below). Or take a look at the label on your dog’s food packaging. 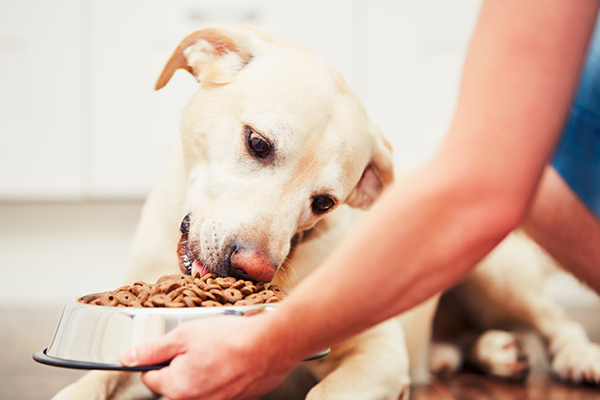 Since 2013, the American Association of Feed Control Officials (AAFCO) has required pet food manufacturers to offer feeding guidelines that include calories. Keep in mind that these are suggested guidelines. For example, on the label of the dry food I feed Kona, there is a feeding guide chart. Based on Kona’s weight, it recommends I feed her 2 cups of food a day for a total of 715 calories. Not all calories are created equal. Photography by damedeeso/Thinkstock. Knowing how many calories per serving is good, but you also need to factor in the nutritional value of the food your dog is eating. Humans get more nutritional goodness from each bite of an apple than from gobbling down a handful of salty potato chips. So, your goal is to choose quality foods that are nutritionally calorie dense, which means every bite your dog gobbles down should be filled with quality ingredients. 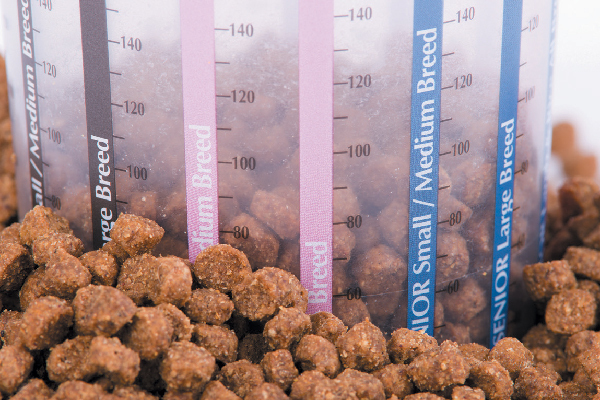 One easy way to practice portion control is to carefully measure out your dog’s food for each meal, based on your veterinarian’s recommendation. Photography ©Jevtic | Getty Images. 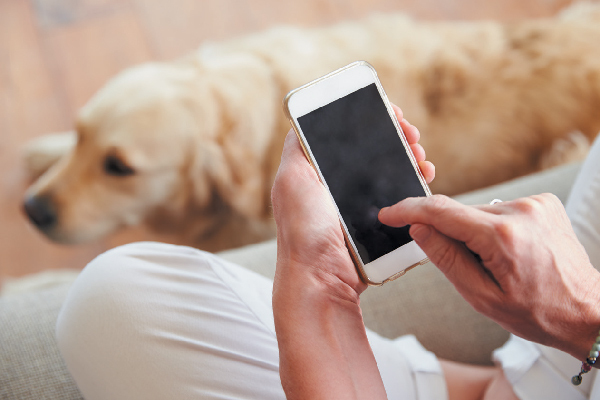 Some apps can help you determine how much to feed a dog. Photography ©monkeybusinessimages | Getty Images. 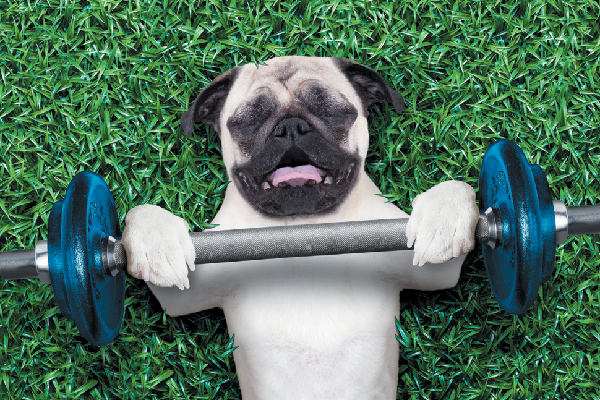 Does exercise help control your dog’s weight? Does exercise help your dog burn off calories? Photography ©damedeeso | Getty Images. It may surprise you to learn that typical daily exercise by your dog — such as a 30-minute walk or a 5-minute game of fetch — does not burn a significant number of calories. So, although taking dogs on daily walks is a healthy decision, not a lot of calories are burned. A dog maintaining a pace of 3 miles per hour on a leashed walk takes about 15 minutes to reach a mile and only burns .8 calories per pound per mile. So, in the case of Kona, she would burn only 80 calories in a one-hour walk. A 50-pound dog who runs for 30 minutes at a 5 miles per hour pace only burns about 70 calories. Veterinarians refer to the 70/30 percent rule, which means a dog who needs to shed excess pounds will tend to lose 70 percent of his calories through cutting back on his food portion and only 30 percent of calorie loss from exercise. Arden Moore, The Pet Health and Safety Coach , is a pet behavior consultant, master certified pet first-aid instructor and host of the Oh Behave Show on Pet Life Radio. Learn more at ardenmoore.com. Thumbnail: Photography ©Monica Click | Getty Images. The post Wondering How Much to Feed a Dog? Let’s Talk How Many Calories Dogs Need appeared first on Dogster.